One of the big things I immediately knew I wanted to do when I moved was to get a new sofa. I’ve probably mentioned it a hundred times but I’ve had my West Elm Henry sofa ever since I moved to the city, and to be honest I’m impressed by how well it’s held up, especially for the price (under $1000, which is cheap for a sofa). For my next one however, I’m thinking about getting more of a higher-quality investment piece. Since the Henry is a very modern and masculine, straight-lined and sort of blocky shape, I’m kind of over that and ready for a more feminine, but still classic style. Nothing too girly, nothing tufted, no Chesterfield. Even though there are tons of styles out there that I like, the English roll-arm is what I came to really fall in love with and focus on. The classic English roll-arm has the rolled arm shape (duh), casters for legs, arms slightly lower than the back and a tight back. What I love about it is that it’s a classic, traditional piece, but can still have a casual feel and really fit well into any decor. Casual elegance, is what I would characterize it as. As far as I’m concerned, it’s just the perfect sofa style! English roll-arm (or similar style). Light gray, performance linen fabric. Must be comfy and not too formal. Turned legs or casters in light toned wood. 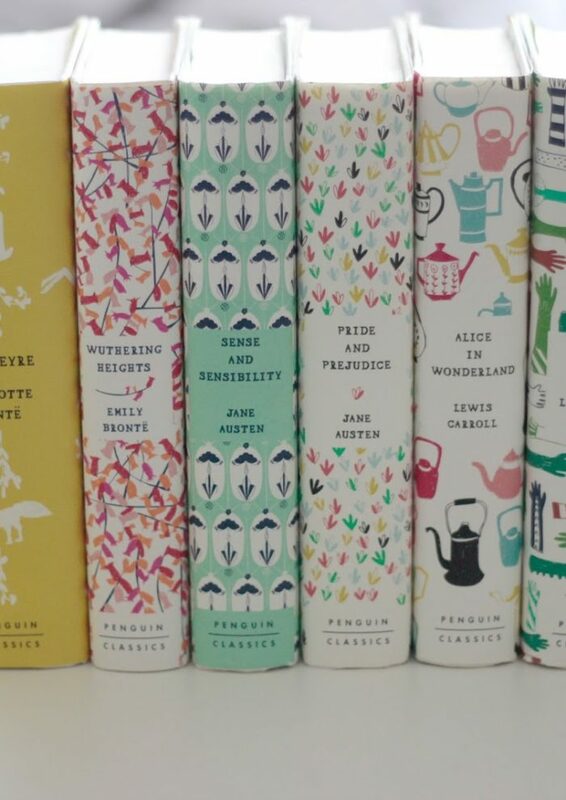 I’ve spent a lot of time looking for the perfect English roll-arm, and I’m still not convinced that I’ve found it…but I have found a lot that I like, so I’m going to share those today along with all of the important points about them. I’ve liked the Interior Define Rose sofa for a long time…it’s just a really pretty English roll-arm, and the price isn’t too bad. I’m lucky that there’s an Interior Define downtown in Soho, so I was able to go and sit on the couch to try it out. Gonna be totally honest here – it’s not very comfy. It just feels very upright. You can’t really sink into it and it feels like you’re sitting up kind of high. It’s also sort of hard and un-yielding. That being said, it probably softens up over time, as sofas do, and also not everyone is looking for that super cooshy cozy thing…plus it’s so dang pretty in person! I also tried this one out at the ID showroom. It’s very comfy. You can really sink into it – it’s almost like a bed. It’s also unusually low to the ground (31 inches height)…not totally sure how I feel about that. The other standout thing about it is how very, very deep it is, with a seat depth of 27 inches. It almost looks like a platform, if that makes sense. When you look at it from the side you can really notice how unusually deep it is. And that’s obviously great for comfort (I’m obsessed with deep couches), but when I sat on it, it was so deep that it almost made you want to really slouch down, like if I sat relatively straight with my back against the back of the couch, my feet almost wouldn’t touch the ground…which is bizarre because I’m very tall. A short person, it’s like, their legs would actually be dangling off the floor. It wasn’t really totally comfy to sit straight up, because your knees didn’t bend at the edge of the sofa. Another thing is that I’m not completely in love with the shape of the arms. Anyway, the thing I do love about Interior Define is the gigantic range of options they have for fabric type and color, as well as leg style. They have the exact fabric I want (a performance linen in light-ish gray), which is surprisingly hard to find. The Maxwell also has glowing reviews online. 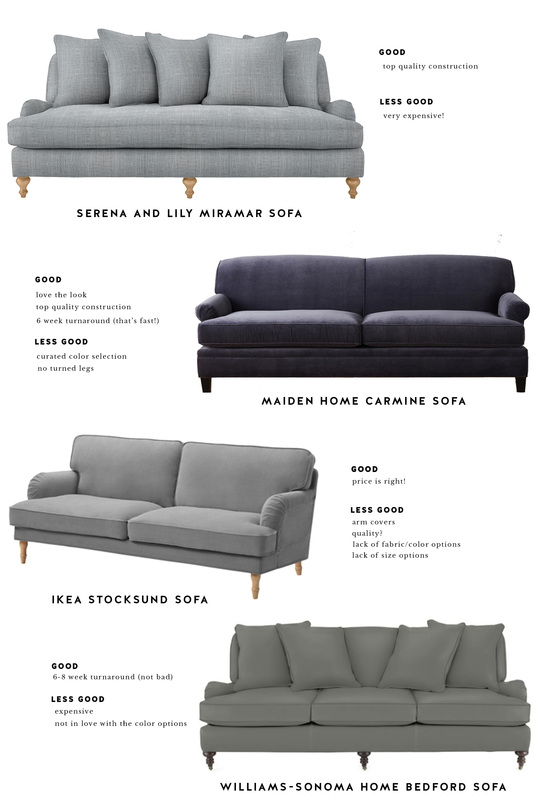 Side-note: Remember the other day when I posted about sofa construction? The ID pieces are well-constructed, with kiln-dried hardwood frames and foam+goose down cushions, and they’re relatively well-priced for that. They ship in 8-10 weeks because they’re made-to-order (that’s a long wait, but not unusual). They also have free white glove delivery and 365-day returns, which is pretty cool. So, the PB Carlisle. This one looks pretty, though I haven’t gone to see/sit on it in person yet (on my to-do list). It comes with the option for a bench cushion, which I love…and this one does not have a tight back like the Rose. I’m not sure whether that’s a pro or a con. With the tight back, you never have to fluff the cushions, which is nice because then it always looks neat…but there’s a potential for it to not be as comfy I would think. Anyway, the Carlisle comes with the option for polyester or down blend cushion, which is good but of course the down costs more. The legs are nice (I like the turnings), but they’re a dark walnut which I don’t love (I’m more looking for a natural latte type color). It’s non-returnable and delivery ranges from 6-10 weeks depending on fabric. For me, they don’t really have the color/fabric combo I want. Seat depth here is 22″. Ah, Serena and Lily. I love their stuff so much…their prices not so much. On the other hand, this sofa is made in a top-quality way – solid kiln-dried hardwood frame, 8-way hand-tied springs, down wrapped cushions with a foam core…for a piece you plan to keep as long as a sofa, and use as much as a sofa, it seems a sound investment. Starts at $4300 though…I mean, yikes. Anyway, this is a classic English roll-arm, with a low slung profile, tight back (comes with five throw pillows), and the classic arm shape. That brings me to my only dislike about the classic English roll-arm – the arms are kind of small, and I’m used to arms you can really lean your head against. 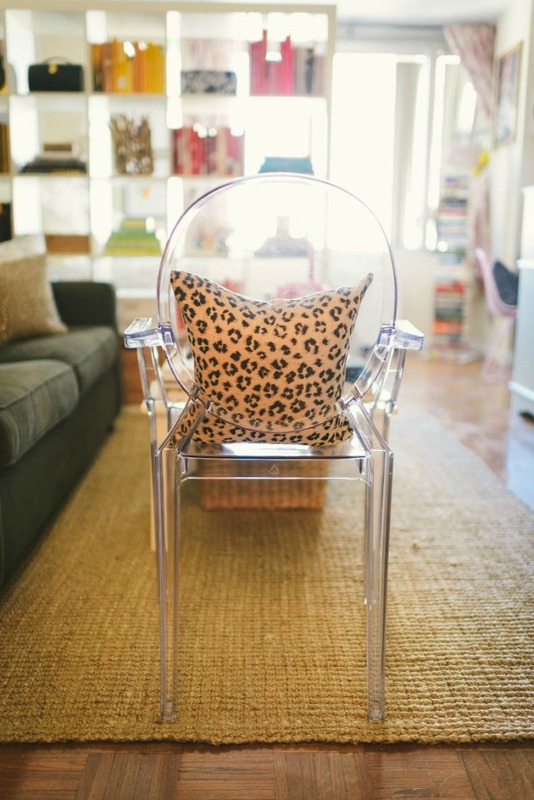 I haven’t seen this sofa in person but I have seen the Miramar side chair, and I can attest to its gorgeousness. Also, this has a bench cushion, which I LOVE. Right off the bat, this was the sofa I had in mind before I got into finding other options. I love the look of the Carmine – the curved back which adds the slightest femininity and the way it’s a great mix of modern and traditional. It’s basically a fresh, modern take on the classic English roll-arm. The construction is top-notch; again, kiln-dried hardwood frame and 8-way hand-tied springs. They also have 30-day returns (although really, who’s going to return a sofa? How would you even do that? ), 4-6 week turnaround (4 weeks is really fast! ), and free white-glove delivery (as opposed to Serena and Lily’s $300 “handling fee”). I sat on this sofa when I visited the Maiden Home showroom and it’s nice and comfy. They’re a relatively small company (versus a big-box store like WS Home), and for whatever reason I prefer that. Their pieces are crafted in North Carolina, which is the area known for furniture construction (it’s where Society Social makes their furniture among many others, I’m sure). The only downside is that Maiden Home has a pretty tightly curated fabric selection, and they don’t have the color I want in a performance fabric. That leaves either pure cotton or pure linen…which scares me. Do any of you have a pure cotton or linen sofa (ie, non-performance fabric)? Does it wrinkle, stain, etc? I’m scared! Side note: I also freakin’ LOVE their Sullivan sofa – it’s their deepest and most sink-in type of piece, with enveloping arms that have a lovely slope to them. I mean I really, really love it. The only reason I probably won’t get it is because it has a heavy, solid feel from the side as opposed to the Carmine which feels much lighter, and for my small narrow space I feel like the Sullivan is too bulky (not in general, just for my particularly narrow space). Dang it!! I guess it goes without saying that this wouldn’t be the highest quality sofa in the world, but my friend actually has a similar sofa from Ikea and I found it to be quite comfortable. Not a fan of those arm covers though…and it’s slightly more modern than I’m looking for. Can’t beat the price though! The WS Bedford Sofa is another option. It’s quite overpriced though I think the quality is high (made in the USA of kiln-dried hardwood…no 8-way hand ties springs though). Sadly, they do not have a plethora of options under the Performance Linen category (only four colors, none of which I like). In fact, not a huge fan of any of their color options unfortunately…and 87″ is a little bit bigger than I was looking for. It’s a really beautiful sofa though. What do you guys think of English roll arms and do you have any great sources that I missed? I found a few online options for custom sofas (where you can literally customize everything), and will probably post about those soon! 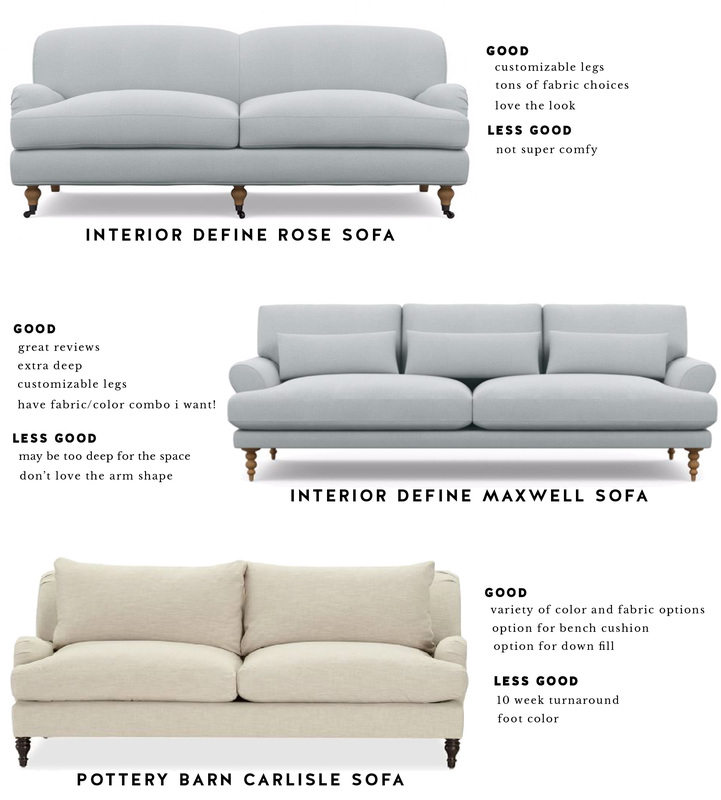 PS: Loving this sofa buying guide? Click here now for a full review of the Maiden Home Carmine Sofa! Thanks for this roundup! I’m getting ready to move and am looking to upgrade to a sectional. I’d never heard of Interior Define, but they look nice and the price is definitely right! I’m going to have to hit up their showroom ASAP! They’re definitely well-priced and have some really nice styles…plus the people at the showroom are super nice and helpful. Hope you find something good! I love the maiden home carmine sofa too. I am impressed with your knowledge of sofas — you have done your research. For what it’s worth, I love that Interior Define Maxwell Sofa! BUT, wait and make sure you find something you love — you’re spending the money, so you might as well get what you want. Thanks Katie! I love the Maxwell too, I just wish it were a teensy bit less deep (especially for my small space). I’m being overly picky I think…but probably because it’s such a big investment. Have you tried to look for a vintage one that would need to be re upholstered? or have one custom-made? just an idea, but what about trying to improve the IKEA one, especially the fabric? Have you ever been to Classic Sofa in NYC? Everything is custom so they have tons of options for fabrics. I have purchased two sofas from them after a recommendation from a friend and I have been very happy with the quality. 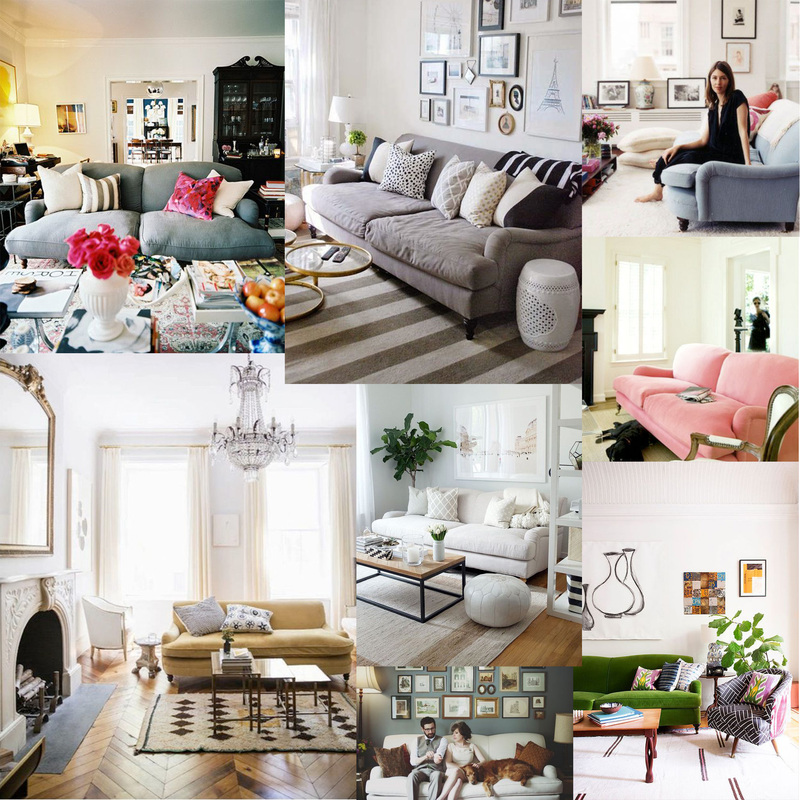 I think many people would be overwhelmed by the sheer number of options in terms of style and fabric but you have so much knowledge about interior design that you could handle the custom sofa process. Love the blog and good luck with your sofa hunt! Hi Cathy! I decided on the Maiden Home Carmine after much, much back and forth – I’ve only had it for a short time but I love how it looks! Great article that definitely addresses the issue I am having as well – thank you! Now that you’ve had the Carmine for a bit, what do you think it terms of durability and comfort? Oh my gosh I have been on the same search, what did you choose? I thought you were going to tell me THE best option out there at the end the article. I’m thinking about a Ethan Allen simply because I can at least test it out & I don’t have that option with the ID Rose sofa, although I have thought about taking a weekend trip to Chicago to visit their store. Haha, I’m sorry, I wish I could say what the BEST choice is but I think it’s up to individual preference and what’s most important to the individual in terms of quality, longevity, etc. I went with the Maiden Home Carmine and it’s gorgeous – super happy with it so far! As I said I absolutely love the look of the Rose but found it so uncomfortable. Ethan Allen is great quality as far as I know, and I think being able to test the piece out is super important! Good luck in your search! I really appreciate all the research. I would buy the Carmine or anything from Maiden Home in a flash but we need a sofa bed. A really good quality one with no toxins! No flame retardant and other toxins is what drew us to maiden home. Did you find any sleep sofas (the comfy sleep kind like the ones ar Room & Bosrd?) I don’t like the “sofa” feel of the Berin room and board but to sleep on it is great. Unfortunately they put toxins in the mattress. So frustrating and inexplicable since other entrepreneurs are making no toxic furniture. Thanks!